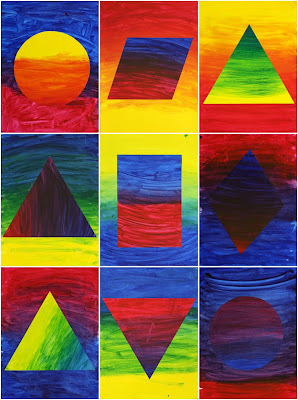 These primary colour gradients were painted by year 5 and 6 students. The process is simple but the results are striking. 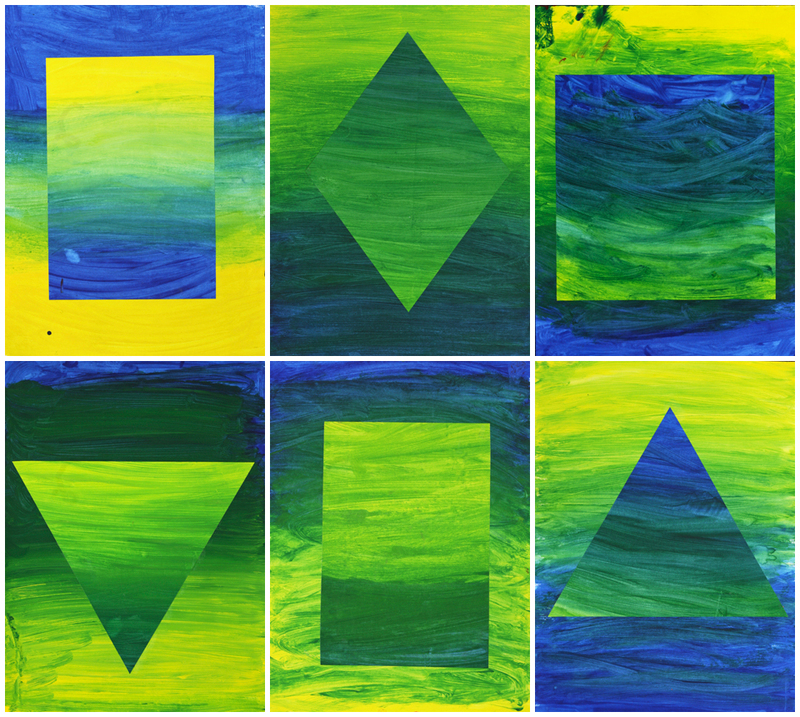 This is a slight variation on my original more detailed Primary Colour Gradient lesson. To read about the process involved please take a peek here. This time around I supplied the students with cardboard shape tracers to cut out their chosen shape before sticking it onto the background gradient. Last time every child used a circle, but I realised that the results would be improved with more variation. What do you think? Awesome results! I love the green/blues but then I am a cool color gal! All of them are really striking! Like the different shapes! When I saw these, I immediately wanted to do them! They are visually striking to me and I think my classes will love them! I'm not sure which I like better, but am leaning toward the angular shapes over the circles. But only a bit. Love them both! Thanks for sharing! Hi Joe, I can easily identify your class's work in the thumbnails on my blog list. It is distinctively you. I have used your original circle project twice. It's the basis for my bog header. This subtle change lends itself to greater things. Thank you. I really like your blog, so I have chosen you for the Liebster Award! Check out my blog (takeachanceonart.blogspot.com) for more details! Your blog is amazing! I am finding such beautiful work. Thank you for taking the time to share your knowledge with the world. So happy to have discovered it! Dramatic impact! They really look great Mr. Hall. I may have to try something like this once my student teacher is complete! Great job as always my far-away friend!!!! Cheers for sharing the great ideas you do with the kids!